Andy Eccleshall lives in Edmonds, Washington, with his wife and their son. He has been a professional artist for 32 years. Born in the Midland town of Stafford, England, Andy began his artistic career at the age of 16 specializing in architectural illustration and landscape painting. Stafford is an ancient town nestled in the lowlands of the North Midlands and surrounded by farmland and moor land. This landscape would serve as the visual inspiration for Andy’s early years and journey in art: mist-covered pastures in the fall, dramatic scenery of the Penine Hills, pastoral rolling landscapes with features centuries old. The crisp light would generate a life long interest in contrast and color. After several years as a fine artist and illustrator, Andy returned to education in 1992 at the Exeter Faculty of Arts and Design in southern England. 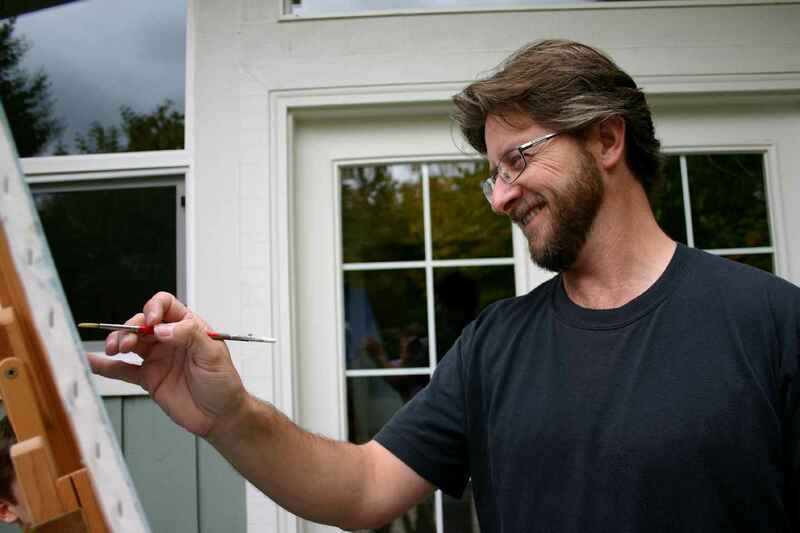 In 1994 he moved to the US as a muralist, starting his own company in 1996 in Connecticut. He continued as a fine artist during this time, experimenting with various artistic styles and learning to represent the different light of this new home. Traveling extensively during the first few years in the States, Andy was dazzled by the enormous contrasts in the landscapes across the country, the indescribable beauty of the changing atmosphere, and the seasons against the never ending and ever changing landscape. Moving to Seattle in 2000 with his family, he continued to develop as a fine artist producing atmospheric landscapes in a realist style, striving to capture how a scene feels as well as how it looks.